'...in suspecting General Tilney of either murdering or shutting up his wife, she had scarcely sinned against his character, or magnified his cruelty.' Northanger Abbey is about the misadventures of Catherine Morland, young, ingenuous, and mettlesome, and an indefatigable reader of gothic novels. Their romantic excess and dark overstatement feed her imagination, as tyrannical fathers and diabolical villains work their evil on forlorn heroines in isolated settings. What could be more remote from the uneventful securities of life in the midland counties of England? Yet as Austen brilliantly contrasts fiction with reality, ordinary life takes a more sinister turn, and edginess and circumspection are reaffirmed alongside comedy and literary burlesque. 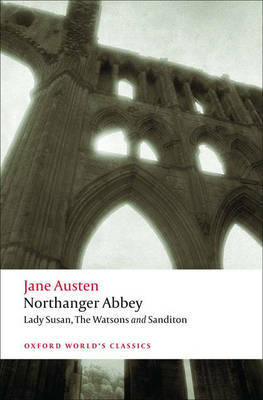 Also including Austen's other short fictions, Lady Susan, The Watsons, and Sanditon, this valuable new edition examines the ambitious and innovative works with which she inaugurated as well as closed her career. ABOUT THE SERIES: For over 100 years Oxford World's Classics has made available the widest range of literature from around the globe. Each affordable volume reflects Oxford's commitment to scholarship, providing the most accurate text plus a wealth of other valuable features, including expert introductions by leading authorities, helpful notes to clarify the text, up-to-date bibliographies for further study, and much more.